North Korea has begun to dismantle facilities that were vital in the development of its intercontinental ballistic missiles (ICBMs), satellite images show. 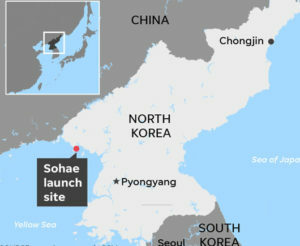 New commercial satellite imagery shows the North taking steps to dismantle the Sohae Satellite Launching Station, its main satellite launch facility since 2012, in an indication Pyongyang is moving toward fulfilling a commitment made by Kim Jong-Un at the June 12 Singapore summit with U.S. President Donald Trump, 38 North reported on July 23. The satellite images show progress in the dismantlement of the station’s rail-mounted processing building – where space launch vehicles are prepared before moving them to the launch pad – and the nearby rocket engine test stand used to develop liquid-fuel engines for ballistic missiles and space launch vehicles, the report said. One corner of the rail-mounted processing/transfer structure “has been completely dismantled and the parts can be seen lying on the ground,” the report said. Additionally, the satellite images from July 20 of the vertical engine test stand show the presence of a crane and a number of vehicles. “The rail-mounted environmental shelter – which hadn’t been moved since December 2017 – has been razed and removed, the older fuel/oxidizer bunkers are in the process of being razed, and portions of the test stand’s upper steel framework have been dismantled and its paneling removed,” 38 North said. The report said the level of activity indicated work at the site is likely to have begun sometime within the past two weeks. “These efforts represent a significant confidence building measure on the part of North Korea,” 38 North said.